Trailer Park: 4:44 Last Day On Earth! "4:44 - Last Day on Earth"
Anyone can tell you if a trailer "looks good" or not. But Drew Magary, who spent over a decade working in advertising, is here to tell you whether or not a trailer WORKS. This week's trailer? "4:44 Last Day On Earth". You may not be familiar with the name Abel Ferrara, but if I were to say the words "Bad Lieutenant," it might refresh your memory. Harvey Keitel. Harvey Keitel naked. A nun being sexually assaulted IN A CHURCH. Harvey Keitel cursing out Daryl Strawberry and masterminding the world's most repugnant traffic stop. No one who saw "Bad Lieutenant" ever forgot it, for better or worse. And now, Ferrara is back with another movie, this one about the end of the world. Between Ferrara and Lars von Trier's "Melancholia," I think we can now declare indie apocalypse movies the hot new trend. Let's take a look at "4:44 Last Day On Earth" and see if we can answer a few questions. Does this trailer let us know what the movie's about? Yes. We learn that at 4:44 in the morning, the world is going to end. "There will be no survivors," we are told. And our host for this unfathomable disaster? Why, it's Willem Dafoe and Willem Dafoe's terrifying jawline. Dafoe is living with Shanyn Leigh, and they'll watch the end of the world together, seeing how mankind reacts to its imminent demise. Please don't tell me there are love scenes involving Willem Dafoe. I regret to inform you that your prayers have gone unheeded. 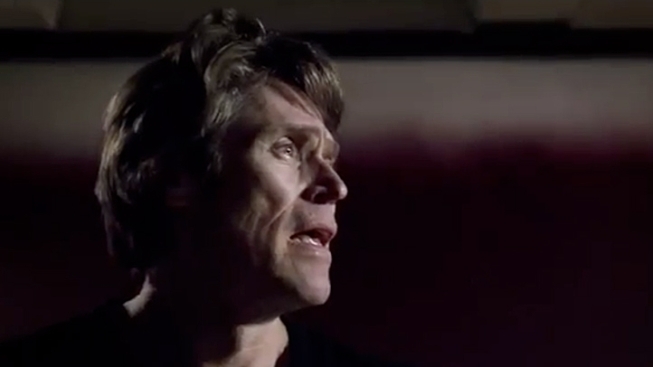 I'd rather see the world end than watch Willem Dafoe make love on camera, but there you have it. He's shirtless, and there's not much we can do about it. Is that the NY1 guy in the opening of the trailer? I think it is! Gotta love Pat Kiernan. Does this movie come with credentials? Does it ever! There are blurbs littered all over this thing. "A masterpiece." "An apocalyptic Valentine." We even get a full PARAGRAPH of lusty praise. Plus the obligatory "this was shown at a festival" graphics. I don't know why indie trailers have this. No one is impressed that your movie was shown at the Venice Film Festival. You can screen a movie in a foreign city and it can still be terrible. It's like if the makers of "Shrek Forever After" held up a graphic that said "Shown to people in Russia a month ago!" Do we get lots of fake news footage of people holding vigils and gathering en masse? We do. Gotta love the fake news footage. Holy smokes, is that Natasha Lyonne? It is! And she appears to be sober! Good for her. Is there lots of existential angst about everyone dying? Most def. We got people jumping out of windows, Dafoe screaming from his rooftop, pictures of the Vatican, all that. Thankfully, there's no indication that a pantsless Harvey Keitel is around. Does this trailer work? No. This is a tiny indie movie that will play at the Film Forum for a week. You're not gonna draw crowds with Willem Dafoe kissing people. It just looks wrong.